Houston • Sunday afternoon went about as expected for the Utah Jazz. Transitioning from an emotional, bruising six-game series against the Oklahoma City Thunder was never going to be easy. Doing it without starting point guard Ricky Rubio made the task harder. Add in having 38 hours to fly to Houston and piece together a game plan against the best team in the NBA this season? 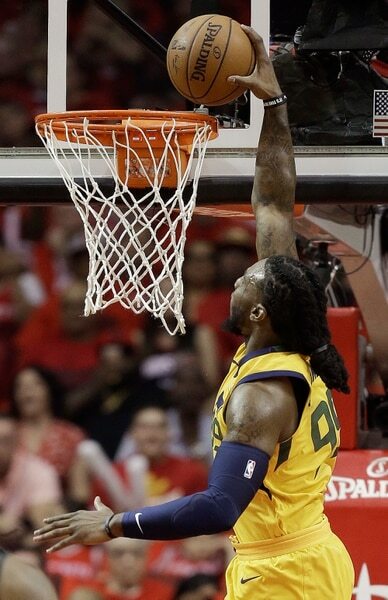 Yeah, Game 1 looked all but impossible for the Jazz on paper. So, nobody should be surprised at Houston’s 110-96 win before a sellout crowd at the Toyota Center. And nobody should be shocked at the manner in which the Rockets took the Jazz out, as Houston was able to build a 27-point lead over a fatigued Jazz team in the first half, and cruised from there. Part of this is the Rockets are really good. They didn’t win 65 games this season for nothing. They’ve been the one team that held a mastery over the Jazz this season, winning all four regular-season matchups by double digits. Sunday continued the trend. The Rockets shot 17 of 32 from 3-point range. Houston superstar James Harden scored a game-high 41 points on a lethal balance of stepback 3s, efficient drives to the basket and the ability to get to the free-throw line 11 times. As hard as it was for the Jazz to guard OKC star Russell Westbrook, guarding Harden is even harder. 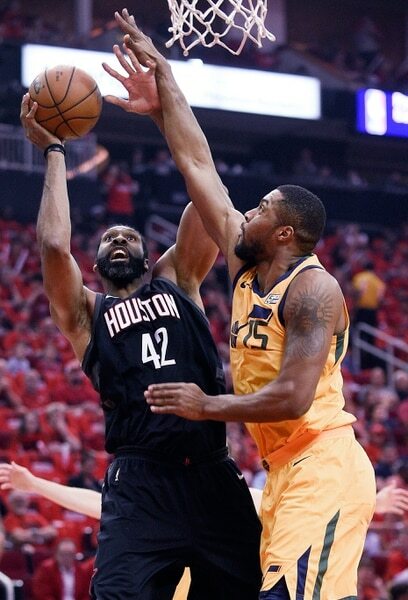 With Rubio out for at least a week with a strained hamstring, the Jazz struggled with Houston’s pressure defense for much of the game. Star center Rudy Gobert, who thrives offensively off playing with Rubio on the pick-and-roll, didn’t attempt a shot until the fourth quarter. The Jazz shot 31 percent from 3-point range, missed nine free-throws and had 18 turnovers. For Utah, playing Houston was like taking a punch from Mike Tyson: You can talk about what it’s like, but you don’t feel what it’s like until you get on the court. Without much time to prepare for a new series, Snyder took Sunday mostly to experiment with different lineups to see what works and what could be effective going forward. The Jazz played Raul Neto rotation minutes for the first time in the postseason, and he responded with four points and a plus-8 net rating in a little over seven minutes. After having success in the previous round with Gobert and Derrick Favors playing heavy minutes together as a post duo, Utah went with small lineups for much of the second half. And Dante Exum played well for the first time in a while in his reserve role, scoring nine points in 15 minutes. Utah showed resilience through the fatigue, playing a much better second half, and cutting the deficit to 11 points on multiple occasions. Crowder had a 3-pointer with eight minutes remaining in the fourth quarter that, had it gone in, would have cut the deficit to single digits. And the Jazz generally looked more confident in outscoring the Rockets 57-46 after halftime. Crowder and Donovan Mitchell led the Jazz with 21 points each. Joe Ingles scored 15 points and Gobert had 11 points and nine rebounds. 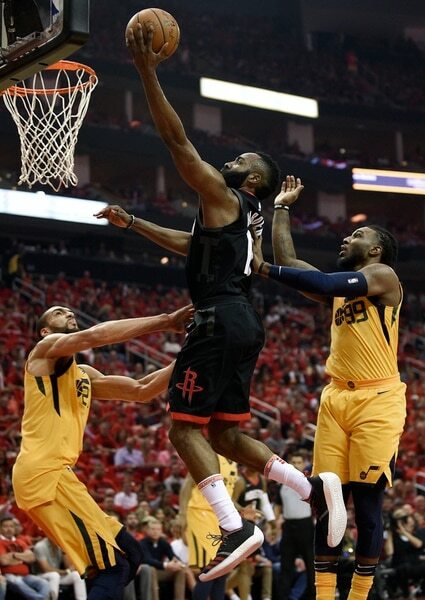 But Gobert failed to block a shot for the first time during the playoffs and had problems with Houston’s Clint Capela, who scored 16 points and grabbed 12 rebounds. The Jazz have a lot to work on before Wednesday night’s Game 2, and they will have to improve significantly. If not, the second round this season could mirror last season’s second round, a four-game sweep of Utah by Golden State on the way to a NBA championship.